President Obama's Victory - Her voice was clear and musical, but deeper than woman's wont. President Obama gets credit for starting the ball rolling on "Don't Ask, Don't Tell" repeal. He gets credit for letting congress know he wanted this done. He gets credit for signing the bill. 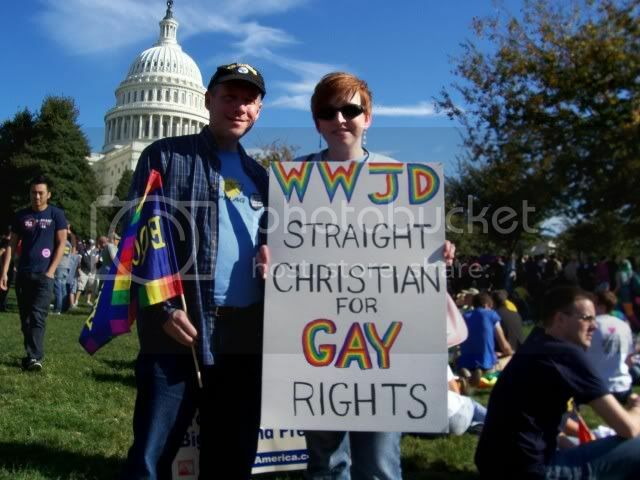 The National Equality March on Washington, October 11, 2009. Michelangelo Signorile, who has been working on this for over 20 years. And thousands of regular people who called/wrote/visited their legislators. And especially PA Rep. Patrick Murphy, who sponsored DADT repeal in the House twice, despite his being in a conservative district (He lost his re-election bid). Another major factor was the recent federal court decision on the Log Cabin Republican's (who endorsed Patrick Murphy's opponent, BTW) lawsuit that DADT is unconstituional, which caused the government and the military to urge Congress to repeal the law and put control of implementation in the hands of the military, and not the courts. But probably the biggest factor was Dan Choi, who has become the face of "Don't Ask, Don't Tell." He joined with Get Equal, which led numerous, well-publicized protests that disrupted government offices and interrupted President Obama's speeches, much to his annoyance. But they were extremely effective. Here is Dan Choi's Angel of the Year Award, the "audio statuette" given by the Michelangelo Signorile Show.